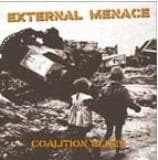 External Menace first saw the light of day on the classic No Future early 80s comp "A Country Fit For Heroes". Since then the band has put out several 7"s, comp tracks and recently put out all their old and rare releases on Captain Oi. This album is all new material as well as recent 7"s. For fans of GBH, Stiff Little Fingers and the Varukers.